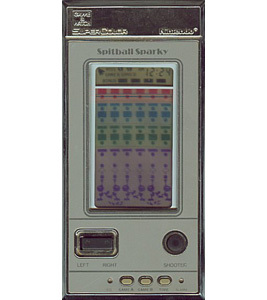 Move Sparky left and right, using the ball to destroy all the blocks on the screen. When the ball passes into the purple area, use the Shooter button to spit the ball back into the air. You get one point for each green block cleared, two points for each blue block and three points for each red block. Red blocks take two hits to clear. In Game B, blocks appear and disappear, and can only be hit when they are visible.